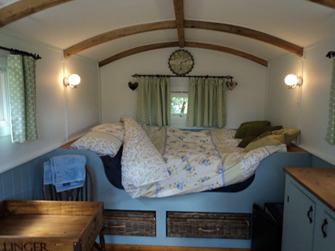 The shepherd's hut was used in the 19th and 20th century by shepherds during sheep raising and lambing, Shepherd's huts often had iron wheels and corrugated iron tops. Sometimes the sides were also made of corrugated iron. Use of shepherd's huts by farmers reached a peak in the late 19th Century and dwindled in the 20th century with the advent of mechanised farm machinery and electric power reaching even remote farms. 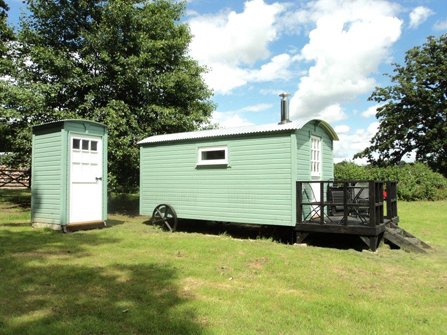 There have been numerous different materials used to construct shepherd's huts and after World War One, when metal was in short supply the chassis were often built with wood and the sides built with interlocking planks of larch or spruce. Sometimes the roof covering would be constructed from felt and tar and insulated with lambswool. Cast iron wheels were frequently recycled from other farm machinery. There are now very few examples of the later 20th century shepherd's huts.